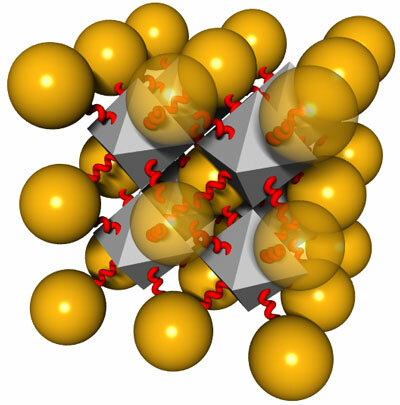 (Nanowerk News) Taking child's play with building blocks to a whole new level—the nanometer scale—scientists at the U.S. Department of Energy's (DOE) Brookhaven National Laboratory have constructed 3D "superlattice" multicomponent nanoparticle arrays where the arrangement of particles is driven by the shape of the tiny building blocks. The method uses linker molecules made of complementary strands of DNA to overcome the blocks' tendency to pack together in a way that would separate differently shaped components. The results, published in Nature Communications ("Superlattices Assembled through Shape-Induced Directional Binding"), are an important step on the path toward designing predictable composite materials for applications in catalysis, other energy technologies, and medicine. "If we want to take advantage of the promising properties of nanoparticles, we need to be able to reliably incorporate them into larger-scale composite materials for real-world applications," explained Brookhaven physicist Oleg Gang, who led the research at Brookhaven's Center for Functional Nanomaterials (CFN), a DOE Office of Science User Facility. "Our work describes a new way to fabricate structured composite materials using directional bindings of shaped particles for predictable assembly," said Fang Lu, the lead author of the publication. Spherical particles, Gang explained, normally pack together to minimize free volume. DNA linkers—using complementary strands to attract particles, or non-complementary strands to keep particles apart—can alter that packing to some degree to achieve different arrangements. For example, scientists have experimented with placing complementary linker strands in strategic locations on the spheres to get the particles to line up and bind in a particular way. But it's not so easy to make nanospheres with precisely placed linker strands. "We explored an alternate idea: the introduction of shaped nanoscale 'blocks' decorated with DNA tethers on each facet to control the directional binding of spheres with complementary DNA tethers," Gang said. When the scientists mixed nanocubes coated with DNA tethers on all six sides with nanospheres of approximately the same size, which had been coated with complementary tethers, these two differently shaped particles did not segregate as would have been expected based on their normal packing behavior. Instead, the DNA "glue" prevented the separation by providing an attractive force between the flat facets of the blocks and the tethers on the spheres, as well as a repulsive force between the non-pairing tethers on same-shaped objects. The DNA tethers lead cubic blocks and spheres to self assemble so that one sphere binds to each face of a cube, resulting in a regular, repeating arrangement. "The DNA permits us to enforce rules: spheres attract cubes (mutually); spheres do not attract spheres; and cubes do not attract cubes," Gang said. "This breaks the conventional packing tendency and allows for the system to self-assemble into an alternating array of cubes and spheres, where each cube is surrounded by six spheres (one to a face) and each sphere is surrounded by six cubes." Using octahedral blocks instead of cubes achieved a different arrangement, with one sphere binding to each of the blocks' eight triangular facets. The method required some thermal processing to achieve the most uniform long-range order. And experiments with different types of DNA tethers showed that having flexible DNA strands was essential to accommodate the pairing of differently shaped particles. "The flexible DNA shells 'soften' the particles, which allows them to fit into arrangements where the shapes do not match geometrically," Lu said. But excessive softness results in unnecessary particle freedom, which can ruin a perfect lattice, she added. Finding the ideal flexibility for the tethers was an essential part of the work. Changing the shape of the blocks from cubes to octahedrons results in a different 3-D arrangement. 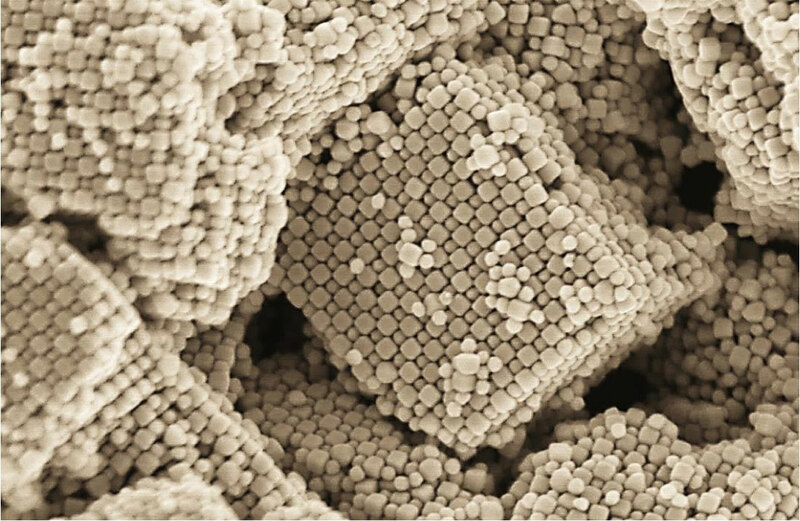 The scientists used transmission and scanning electron microscopy at the CFN and also conducted x-ray scattering experiments at the National Synchrotron Light Source, another DOE Office of Science User Facility at Brookhaven Lab, to reveal the structure and take images of assembled clusters and lattices at various length scales. They also explained the experimental results with models based on the estimation of nanoscale interactions between the tiny building blocks. "Ultimately, this work shows that large-scale binary lattices can be formed in a predictable manner using this approach," Gang said. "Given that our approach does not depend on the particular particle's material and the large variety of particle shapes available—many more than in a child's building block play set—we have the potential to create many diverse types of new nanomaterials."